Just as expected, Samsung is the third company to join the Android Wear fun, announcing its Gear Live smartwatch. 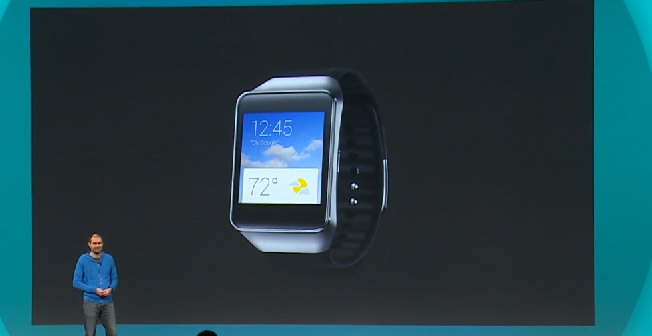 The watch is water resistant and will be available for purchase later today from the Google Play Store. The Gear Live looks a lot like the Gear 2. While virtually no specifications were provided, it seems that the Gear Live will carry the same 1.63″ Super AMOLED display with a resolution of 320 x 320 pixels. Gear Live can be paired with any Android 4.3+ device, not just Samsung ones like the Gear 2 and Gear 2 Neo. The Samsung Gear Live will be available for pre-order for $199.99 through the Google Play Store and you can purchase it directly on July 7. Best Buy and Amazon will also offer the device.